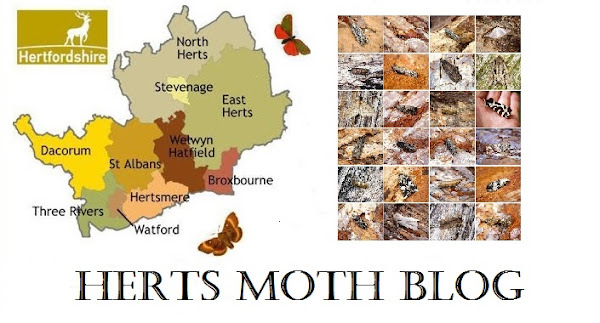 I gave some moths for dissection to Graeme back on the 08th of July to look at. One was an unusual asymmetrical Pug which looked very odd indeed and we both couldn't place it at the time. The other was a Nemapogon species and looked a little paler than the Nemapogon cloacella that I regularly get in the garden. Both specimens were part of a catch of moths made on the 06th of July. The Pug turns out to be my latest ever Oak-tree Pug, with the previous latest a whole month earlier on 06/06/13! The books do state that they can straggle on until late July in some years but i've never experienced that myself. The Nemapogon is Nemapogon ruricolella and a pleasing addition to the garden list and being only the 3rd species of Nemapogon for the garden joining cloacella (of course) and clematella (oddly). Here are the pictures, Nemapogon ruricolella wasn't a new moth for me as on the 19th of June I recorded one at Home Wood in Bedfordshire (pic attached for a comparison to my garden specimen).